Includes: bra, belt, skirt, arm bands, wrist cuffs, necklace, headband, half-circle chiffon veil. 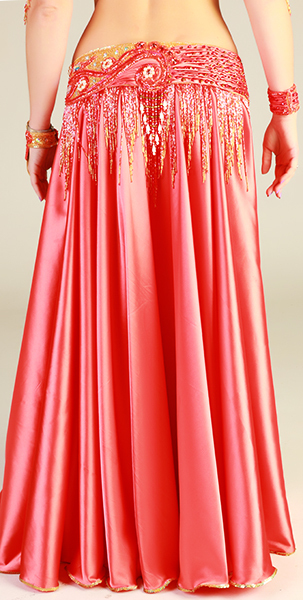 Fabric: coral satin-like. Beading: coral, red, skin-color, gold, pearls, AB stones. Bra: small C cup. 35" from end to end under bust. Belt: one-piece belt, 38" from end to end. Skirt: big circle skirt with one slit. Length: 40".